Seed buying is one of coziest chores of winter—sitting by the fire, flipping through seed catalogs, and earmarking the purple carrots or striped eggplants that promise warmer days to come. Understanding the labels for seeds can be confusing, especially when there are so many choices. What exactly does it mean if a seed is open pollinated or non-GMO? Here’s a list of some seed buying jargon you might come across, with an explanation of what it means, and why these terms matter. Cultivar is a combination of the words “cultivated variety.” That is, a variety of plant that has been cultivated (through hybridization or open pollinated) and retains its traits when reproduced. Cultivars are often called varieties in seed catalogs. An example would be Green Zebra Tomatoes. Green Zebra is the cultivar. Characteristic traits of this variety are the yellow/green stripes, emerald flesh, and size of the fruit, which are passed down through reproduction. GMO’s are organisms that have been produced through high-tech genetic breeding or traditional plant breeding. Generally, the former is what people mean when they are talking about GMO’s, but these are specifically a type of GMO called GE (Genetically Engineered). Traditional GMO’s were developed through monitoring and selecting seeds for specific traits over time. One GMO that was developed through traditional plant breeding is seedless watermelons. Genetically Engineered, on the other hand, involves injecting specific genes directly into an organism through high-tech means. Examples of these crops are GMO corn and soybeans developed for large agribusiness. Home gardeners will not find GE seeds in seed catalogs, but the scale of production of GE crops has made guaranteeing certain seeds to be non-GMO, like those for corn, difficult due to natural cross pollination between neighboring fields of GE corn and other corns. Adequate distance is needed to ensure that no cross-pollination has occurred. Double-check the catalog as some companies guarantee their seeds to be GMO free. Heirlooms are open pollinated varieties of plants that were developed before the 1960’s, when hybrids began to be developed. Before commercial seed companies existed, most of these seeds would have been passed down generation to generation by home gardeners who saved seed. Examples are Brandywine Tomatoes. A hybrid is the result of two intentionally crossed parent plants. Hybrids are bred to select a single characteristic, like disease resistance, fruit size or color. This could be important to the home gardener, or not. Fungal disease resistance in tomatoes, for example, may be more important to the gardener in warm, humid climates than colder climates. Hybrid seed can be more expensive that open pollinated seed. Since each hybrid is a specific cross between two plants, that cross must be intentionally made each year. If you save seed from a Big Boy tomato, it will not have the same traits as the parent plant. 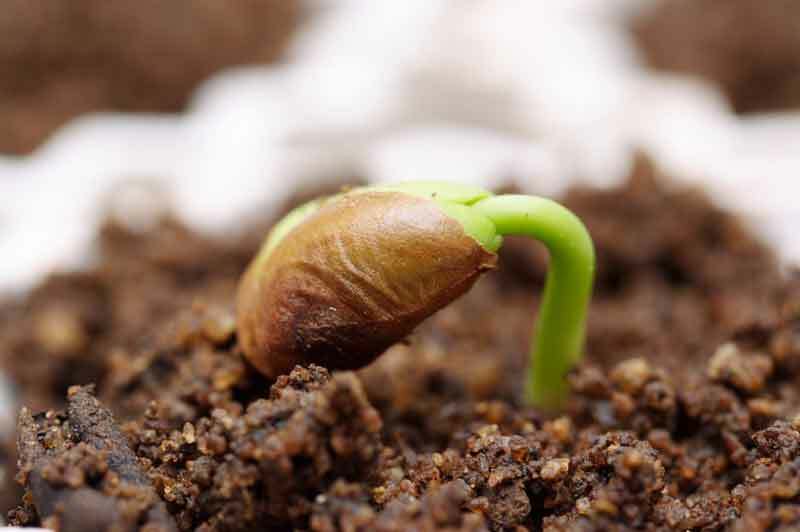 Seeds that are open pollinated have been pollinated by insects, wind, or self-pollination. Typically seeds that have been open pollinated can be saved and will carry the same characteristics as the parent plant. All heirlooms are open pollinated. Certain plants like squash and pumpkins, however, are easily cross pollinated and should be grown with some distance between them if you plan on harvesting your seed.